In the first ten years of the Astrodome's existence, it was ranked by the U.S. Commerce Department as the third most popular manmade attraction in the United States. Every year, more than 400,000 people came to see the "Eighth Wonder of the World," as it became known. Most Houstonians were proud of the association of their new dome with space exploration. In the 1960s there was nothing more exciting, more fashionable, than astronauts and outer space. President Kennedy had declared in his famous 1962 speech at Houston’s Rice University, "We choose to go to the moon," and the national commitment to exploration (and, not incidentally, beating the Soviets in the space race) ignited the imagination of millions of Americans. Just weeks before the opening of the Astrodome, in fact, the first crewed Gemini flight took off from Cape Kennedy. The timing was perfect. The new NASA facility was located just south of Houston, in Clear Lake. Its proximity was a chance to brand both the Dome and the city of Houston as modern and technologically advanced. Astrodome developer Judge Roy Hofheinz (also known as just "the Judge") tacked the "Astro-" theme on to everything he could -- he even recruited 22 astronauts to throw out the first pitch of the first official game, on April 13, 1965. AstroTurf square. Contributed by Bill Vaught. Houston Metropolitan Research Center, Houston Public Library. While the dome roof was originally designed to be transparent, when the Astros began to play baseball there in 1965 they quickly discovered that it was somewhere between difficult and impossible to see pop-ups during day games because of the glare (more on those difficulties here). Hofheinz ordered the roof painted to cut the glare, at which point the grass died. After watching the Astros play most of their season on dead grass, painted green, Hofheinz implemented the solution that became one of the most persistent parts of the Astrodome's legacy: AstroTurf. AstroTurf was developed by an R&D section of Monsanto Chemical Company, which was looking for opportunities in the consumer market (Gast, 159). They developed a carpet of interlaced nylon fibers and called it Chemgrass. When Hofheinz learned of Chemgrass, he met with Monsanto executives, who agreed to install their brand-new carpet in the Astrodome as a testbed in time for the next baseball season, free of charge. Changing the name of the product from Chemgrass to AstroTurf was a marketing triumph for both Hofheinz and Monsanto. Although the product would not become profitable for many years, it was installed at many other ballparks and enjoyed consumer name recognition as well due to the development of the AstroTurf doormat with its iconic white daisy. Astrodome. (1964). Special Collections, University of Houston Libraries. The dome was designed to be multipurpose, to be used for a variety of sports, concerts, conventions, and any other public gathering Hofheinz could think of. But its primary purpose was to provide a stadium for major league baseball in Houston (more on how that happened here). "Everything had to be spotlessly clean. We went to several World Series together. He saw how dirty the stadiums were, and he said his stadium was never going to be that way....He said he was going to have the best dressed people in town, in neckties and coats, with air conditioning, and he was right. He got people out to baseball games that wouldn’t go in other cities" (Ray, 337). After the Astrodome's hugely successful launch, sports teams across the country began their own investigations into the feasibility of enclosing or replacing their ballparks. Even in Boston, Red Sox owners considered replacing venerable Fenway Park with an enclosed stadium far from the original location. In Detroit, discussions of building a dome lasted into the early 1970s, and were revived in the mid-1980s when owner Tom Monaghan hired engineers to look into adding a roof to historic Tiger Stadium. In 1966 nearby Louisiana residents passed legislation to fund a dome in New Orleans--by the largest margin in state history. The Superdome opened in 1975. In early 1967, Harris County Commissioners were informed that Hofheinz had ordered a substantial remodeling of a section of stadium behind the scoreboard. Judge Hofheinz had recently lost his wife, sold his home, and was living in a hotel as a result of his efforts to raise money to buy out former partner Bob Smith. He decided to enlarge his two-story Astrodome office suite into a five-story residence for himself and VIP guests. The renovations would be paid for the Houston Sports Association (HSA) of which Hofheinz owned 88% of the stock (Ray, 362). Israel, Harold. Foyer to the Presidential Suite in the Astrodome. Copyright Astrodome USA. The Judge hired a former Disney designer to help him select antique furnishings and develop themes for the various rooms. Hofheinz's private quarters eventually included a miniature golf course, a bowling alley, a beauty parlor, and a puppet theater for his grandchildren. 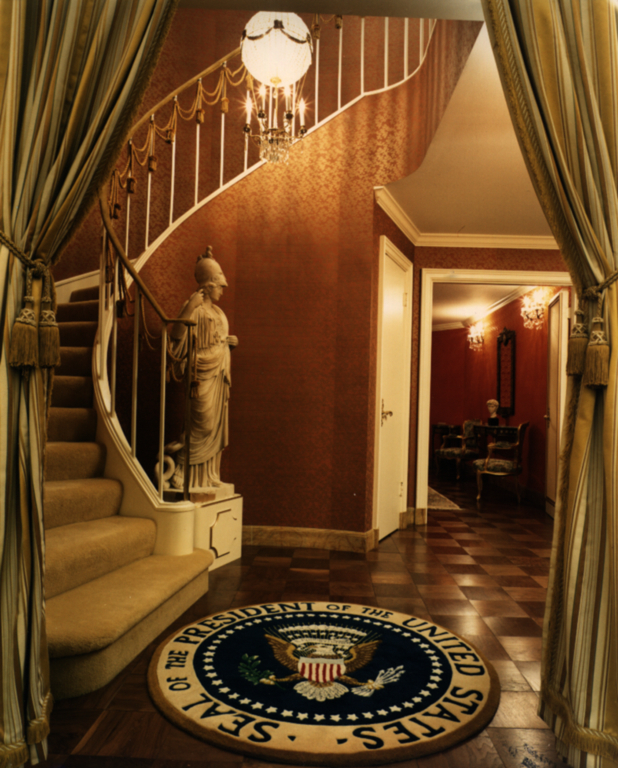 In an effort to lure President Johnson to visit the Dome again, Hofheinz included a presidential suite, complete with the official seal said to be used with permission from LBJ himself. It could also serve as a marketing tool to wow other potential clients, including both the Democratic and Republican 1968 national conventions.